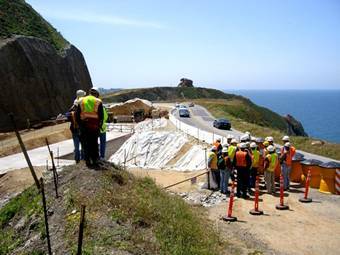 On this sunny day in May 2007, the NCGS got a preview of an ambitious CalTrans project which is scheduled for completion in 2011: construction of twin tunnels, each 4,200 feet long, plus a 1,000-foot bridge which together will circumvent the geologically unstable Devil’s Slide area of Highway 1 between Pacifica and Montara. Grant Wilcox, Senior Engineering Geologist, CalTrans, lead off this trip with a presentation about the history of the region and current activities on the project. 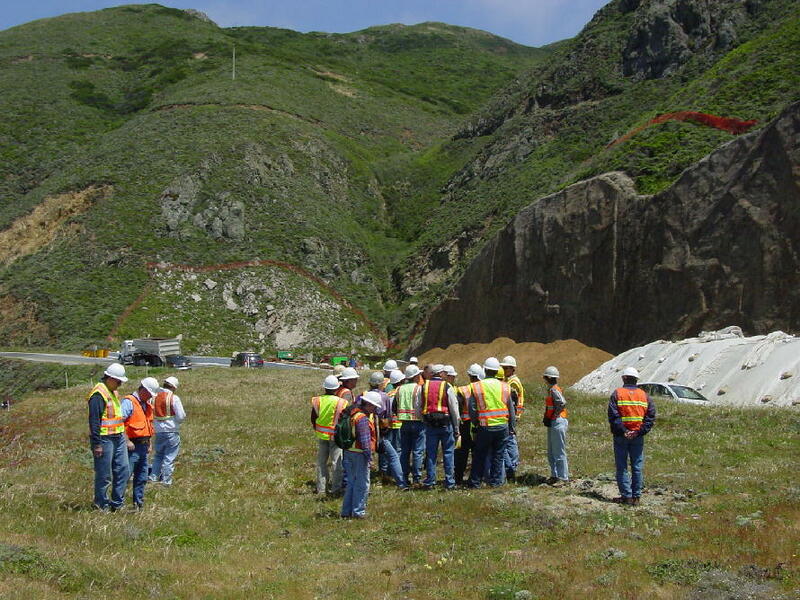 He reviewed the basic geology of the area, some of the many landslides and rockslides that have occurred along the roadway, various alternatives that had been proposed to deal with the area and described the tunnel and bridge project now underway. Grant has been working for about 18 years here, and was a staff geologist in the area during the big 1995 slide. 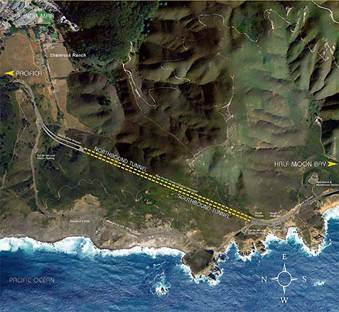 The photo of Highway 1 below was taken by Mike Wong owner of the Spring Mountain Gallery in Half Moon Bay. The roadbed had dropped by several feet and there was concern that an entire lane will fall into the ocean, as happened in 1980. This was not an easy repair as the slide seen is actually a slide within a slide within a slide. At that time it was not possible to cut back further into the slope, or to build a bridge over the active slide area. 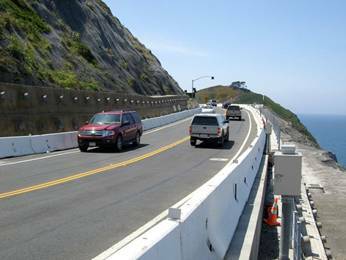 The road remained closed for over five months while CalTrans cleared the area and essentially stitched together the edge of the mountain using concrete “whalers” attached to tiebacks. A similar repair was required in 2006, this time using much deeper, 150-foot tiebacks. 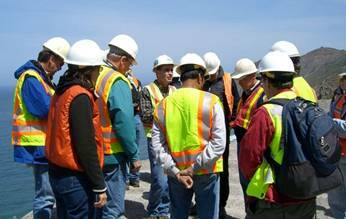 After a great presentation, we donned hardhats and safety vests at the CalTrans construction trailer in Pacifica and carpooled to the slide area to get a firsthand view of the work that Grant described. 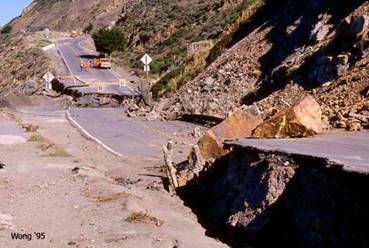 At Devil’s Slide, Grant Wilcox described the repairs following the 1995 slide. The rockslide at the level of the roadbed and also higher up the mountain was cleaned up using explosives to bring down loose rock, and a curious piece of machinery called a Spider worked it’s way down the steep slopes to pluck large boulders from the upper end. 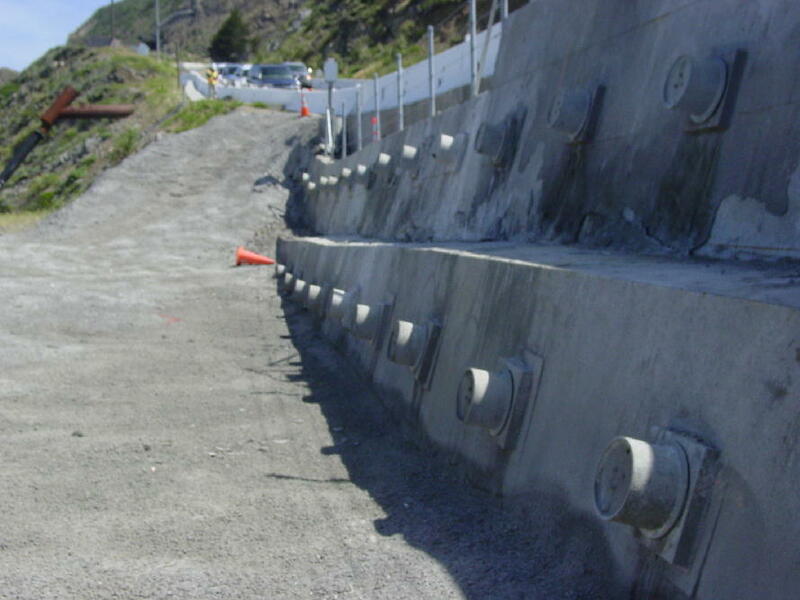 The area was then secured with rock dowels and shotcrete. This fix cost almost $3 million and although it held pretty well, was considered temporary. Indeed, prior to the current road, three previous roads were constructed and then abandoned along this stretch of coastline. In addition, one can still see the trace of an old railroad bed (it looks like a geologic feature), below the current roadway, abandoned in 1922. 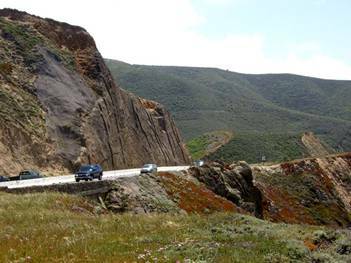 Highway 1 is built on a dynamic coastline that experiences frequent mass wasting. The road has sunk over 47 feet since its current alignment was built in 1937. The bedrock here is hydrothermally altered quartz diorite and granodiorite in fault contact with claystone, siltstone, sandstone and conglomerate. The area includes several additional thrust faults and is affected by seasonal rains, year-round springs and fog water accumulation. The geologic cross-section on the NCGS website shows rock type and fault location relative to the tunnel location. On the photo below (from the CalTrans project website http://www.dot.ca.gov/dist4/dslide/) note how the tunnel is well behind the landslide area. In this view, east is to the top. 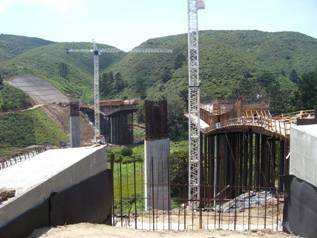 The bridge will connect the north end of the tunnel to the current Highway 1 roadbed. The tunnels are being bored from south to north, with a 2% grade for drainage. Estimated cost for the whole project, including the bridge, is about $300 million. The two tunnels are each 4200 feet long and 30 feet wide, have 11 cross-linking passages between them and are also accessible to bicyclists. As the tunnel boring is being done, there will be opportunities to capture geologic information. Next we traveled to the southern end of the slide area to look at the culverts being built to get tunnel and spring water out and also to be used for sediment settling purposes. Building the tunnels and their drainage network also effectively dewaters the mountain, to the point where some of the farmers’ ponds may dry up. Accordingly, water systems have been designed as part of the tunnel construction that will be used to replace that pond water if it becomes necessary to do so. After lunch, we walked a bit further south and saw the large fake-rock wall that was applied over a “soil nail” wall to stabilize the road-cut area. In the opinion of the author it is a real shame to cover a road-cut with fake rock. However, had this not been done, CalTrans would have had to remove even more of the mountain, so I suppose it is a good solution and I will have to satisfy my geological curiosity elsewhere. Our final stop was at the northern end of the bridge that is under construction. Standing on the banked plywood one can imagine cars zipping by, over a gracefully curving bridge into the mountain and emerging on the other end. 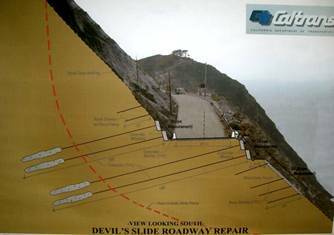 So will end the next but likely not last chapter in the saga of Devil’s Slide. 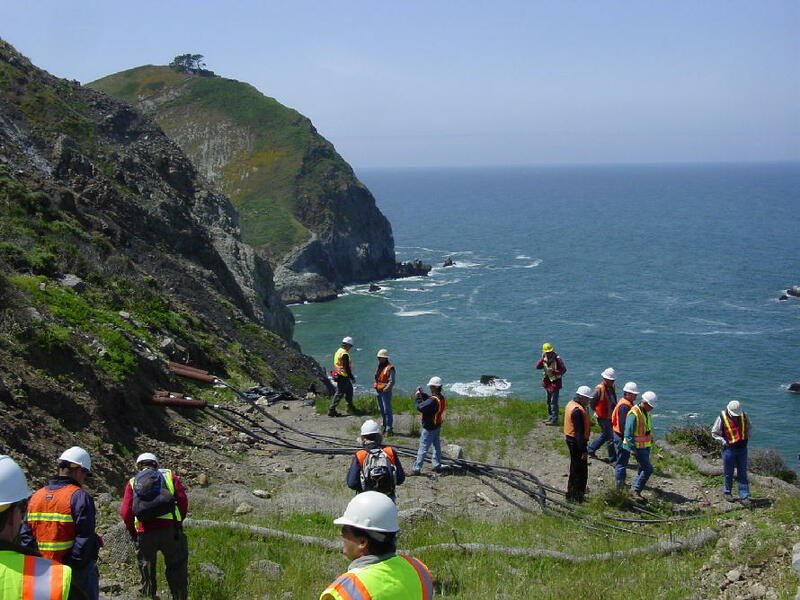 The Northern California Geological Society thanks Grant Wilcox for leading this most informative trip. We would like to be able to visit the site again in the future, when the actual drilling is well underway, and we also extend a standing invitation to Grant to join us on other NCGS field trips. We also thank Rob Nelson for his work in organizing this trip.